I made the base with my Modular AutoRigging with quadrupeds legs. I worried much about the ease and simplicity of the controls, shoulders and spine system for example. The first two were made for the Coca-Cola (VetorZero) and the last to Bradesco(Laruccia). About the tools created for this project. In this work, I made this tool that connects the face of all the characters in a simple and very fast.It takes almost 2 minutes to be ready with facial rigging. The tool makes the job of connecting the Blends, deformers and clusters all of the character. 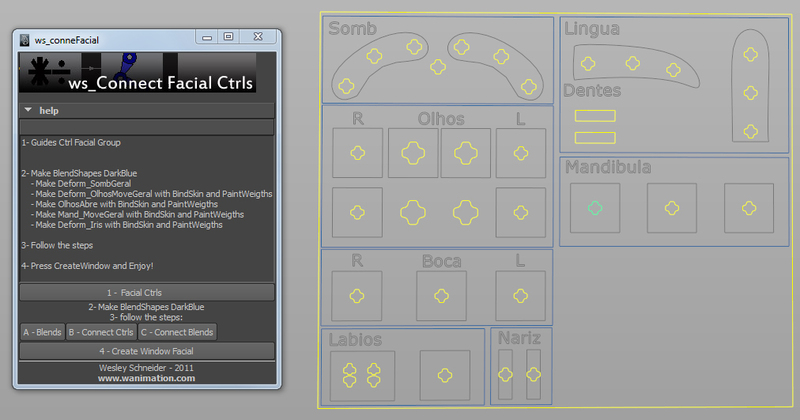 Itself creates the GUI panel face, thus standardizing the face.I used it in the last Dog Rigging, because it is part of a collection of more than 7characters where everyone is standardized with riggigs facial.Saved much production time can focus on more complex things.I would rate this tool “ws_Connect Facial ctrls” as one of the simplest I have, but in a production of many characters it is very efficient, which means anyone canuse it. Thanks all my friends from Laruccia and VetorZero. Eu fiz a base com meu Modular AutoRigging, com pernas para quadrúpedes. Me preocupei muito com a facilidade e praticidade dos controles. Como os controles de ombros e o sistema da coluna por exemplo. Os dois primeiros foram feitos para a CocaCola(VetorZero) e o ultimo para o Bradesco(Laruccia). Sobre as ferramentas criadas para este projeto. Neste trabalho, fiz esta ferramenta que conecta os faciais de todos os personagens de uma forma simples e bem rápida. Leva praticamente 2 minuto para estar com o rigging facial pronto. A ferramenta faz o trabalho de conectar os Blends, Clusters e Deformadores todos do personagem. Ela própria cria o painel GUI do facial, padronizando assim os faciais. Usei ela no ultimo Dog Rigging, pois ele faz parte de uma coleção de mais de 7 personagens onde todos estão com os riggigs faciais padronizados. Economizou muito tempo de produção podendo focar em coisas mais complexas. Classifico esta ferramenta “ws_Connect Facial Ctrls” como uma das mais simples que tenho, porém em uma produção de muitos personagens ela se faz muito eficiente, onde qualquer um pode utiliza-la. Obrigado a todos meus amigos da Laruccia e VZ.